SEAS CA11RCY H0149-08 11 F-GX Woofer New 2017 manufacture Midwoofer. £58.95 ea. excl. VAT. Smooth response hand-coated 4.5"" paper cone, natural rubber surround. Smooth extended response, low resonances and distortion. Low Q. Minimum purchase 2 units. Limited Availability. 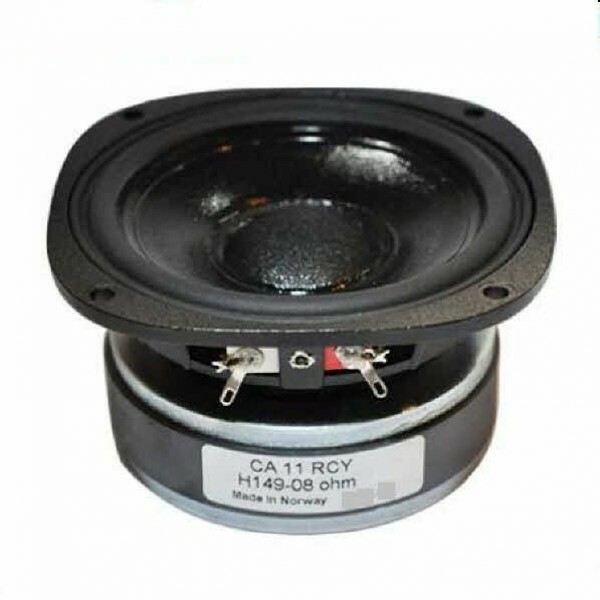 Seas CA11RCY H0149-08 11 F-GX Woofer New 2017 manufacture is a Seas 4.5" Woofer with a stiff and stable injection moulded metal chassis. Especially made for Falcon Acoustics. A natural rubber surround and hand-coated paper cone with low resonances and distortion. Excellent linearity is achieved with a large magnet system and a symmetrical driving force accomplished with a special winding technique for the 26mm voice coil. A very large magnet system provides a reasonable efficiency and a low Q.